This study attempts to examine the lives of Syrian refugee women, in light of their conflict-induced displacement and settlement in The Netherlands. 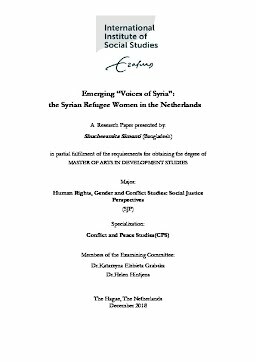 The main research question of this study is: “How has conflict-induced displacement from Syria and settlement in the Netherlands impacted the agency and empow-erment of Syrian refugee women?” The purpose of this study is to explore the intersectional dynamics of empowerment and agency of the Syrian refugee women living in the Netherlands. The study uses concepts of gender, intersec-tionality, generational relations, agency and empowerment in order to answer the research question. The main research methods adopted are semi-structured interviews and ethnography. The study suggests that from the moment of leav-ing Syria till settling in the Netherlands, there has been significant changes in the lives of the Syrian women, with regard to their gender roles and agency. Being a Syrian woman and a refugee, they have experienced empowerment and disem-powerment simultaneously. Given the complexities experienced as a refugee woman, participating in different NGO activities is important for some as it en-ables them to empower themselves as well as contribute towards the cause of Syrian refugees by crushing the stereotypes, and by sharing their stories. In this process, many of the women find themselves as becoming the “Voices of Syria”.